I attended the AGIdeas conference last week and while it took some time to get into the groove, the third and final day was an absolute doozy. With almost entirely, unequivocally brilliant speakers, I walked away on an inspired high, as well as somewhat more in the know, about the thudding down-to-earthness surrounding the protection of ‘intellectual property’. Trevor Choy, principal of Choy Lawyers, deals in the business of brand protection. Given the sudden intake of breath as he confessed his hourly fee in front of thousands of students, his presentation was based more along the lines of the pre-emptive strike. Trevor has contributed to the recently published, A Guide to Intellectual Property for Australia’s Graphic Design Industry. 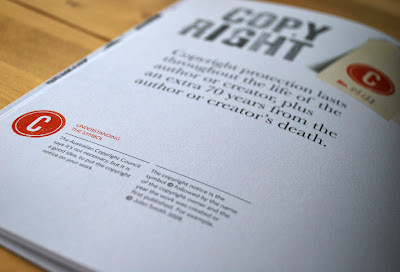 Produced by Design Victoria, together with IP Australia and AGDA and designed by Studio Round, the free booklet is an easy to digest, informative heads up, on the logistics of copyright, trademarks and intellectual property protection. 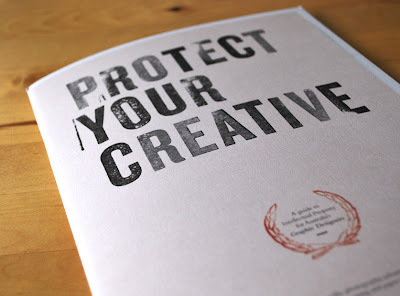 While the guide is aimed at graphic designers, the principles are the same in the craft world. While the laws described are limited to Australia, it also points the reader in the right direction concerning international copyright law. Most will have heard, or have firsthand experience of copycat borrowings and outright plagiarism, (if not, let me tell you it’s like being zapped back to two year old tantrum mode: it’s the blatant unfairness of it all). Many will be aware of the recent debacle involving indie designer, Rosa Pomar and Dutch clothing company Oilily. Excellently, it seems Rosa Pomar ‘won’ that one. It can also be galling for those in the crafty know, who generously blog their top tips and offer free tutorials. It is only a few who ignore the request for personal use only and rush to sell replicas at the local market or nearest online store. But it is these few who make people like Nicole, at You SEW Girl have a really bad week and need a really “good whinge”. And understandably so. Interestingly, Trevor Choy noted the psychology involved in dealing with those who ‘borrow’ designs. Apparently, it’s best as an owner of intellectual property to be on your toes and react speedily. Copyright abusers often start out knowing what they are doing is wrong and have a certain degree of discomfort surrounding this. However, as time goes by, there is a tendency to justify and rationalise actions. It is generally easier to put a stop to copyright abuse when people are in the initial throes of guilt, rather than down the track, when they are feeling more comfortable and convinced of their ownership! PPS. As you can imagine, I haven’t dared publish the above images of the ‘guide’ or this blog post without the permission of Design Victoria. I am also in need of an extremely strong cup of tea after all that linking to everyone. Wow that's incredible, I can totally understand how pissed off people must feel when their work is ripped off, hey I've even seen it happening in teaching! Great news about the Rosa Pomar victory over Oilily! Great post Tania - as it is a topic we all need to think about! Thanks for the great links for more info. That "you thought we didn't notice" site is great. (btw your link to it is broken though!). Glad to hear you got some inspiration from your days at the conference. Really interesting post! I enjoyed the link to 'you thought we wouldn't notice' as well. Just thought I'd clarify my IP issues... I actually don't worry too much about people using my patterns to sell bags and purses - I'm not trying to sell bags and purses. I'm more worried about people sharing the actual patterns, instructions and methods - selling those is how I (try to) make a living. Thanks Tania. Have been wondering how similar is too similar recently. With my things I feel like it's tricky but I was a bit upset by something recently. Will follow your lead and try to learn more. Yep it will be good to get educated. Thanks for the post. I find the copyright issue difficult with a lot of craft stuff where techniques have actually been around FOREVER. I understand that copying someone's special design (if indeed there's something UNIQUE about it) is not on particularly if you then go and sell it (as in the Oilily case, blantant rip off!). But a lot of concepts (eg softies) are not new in themselves. Blogging tips and tutorials on how to make them is helpful and generous,but unless a technique is new and has been patented then it can't be claimed as original, can it? What do you think? Clearly you're getting well-versed in the whole thing which seems wise. I'm interested because I want to do the right thing, but I don't sell things nor do I intend to at present so it's more just curiosity. Gina - thanks for your comment. There is no doubt that the whole copyright thing is a murky and curly issue. Especially when you throw in a (never black and white) creative element. "...it is not the concept or the idea in the work but its expression that is protected by copyright law. 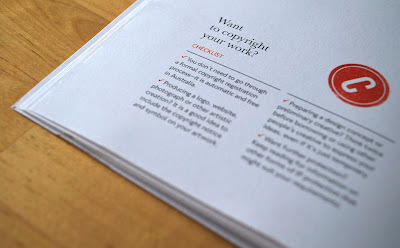 Copyright does not protect your ideas, or the information, styles or techniques, used in creating the work." "...gives a designer or the client exclusive IP (intellectual property) rights to the visual appearance of the product, but not its feel, material or how it works (patents protect function). For example, a new and distinctive design of a desk could be registered, but not the workings of the height adjustor." I am fearful of accidentally replicating someone else's work - particularly since I know how horrible it feels. I don't, however have issues with making up a pattern for a wraparound skirt and selling those (presumedly there is no wraparound skirt patent? And how many ways are there to make a wraparound skirt?). I would make every effort to avoid producing a wraparound skirt with the same decorative twists and detail ("visual expression") as somebody else though. I guess there is an added element for me on top of all that: the karma factor (try making that one stand up in court!). Did that answer anything? Surely it goes down as the longest comment ever written? Thanks Tania, that's helpful, particularly the distinction between IP and copyright, and the idea of visual expression. Right now I'm glad I'm not a designer! But I'm also glad you guys are out there, making amazing things and being generous with your talents too. Who’s The Lucky Girl Then?